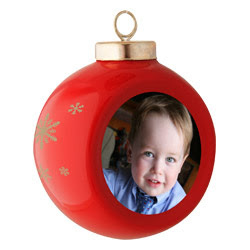 You can get a free red or white photo ornament at SeeHere.com right now. Just use the code MALLORNAMENT at checkout and you’ll see your account credited. 1. Login before you start to create your ornament. 2. You will have to run an add-on the very first time you upload photos. The offer says is valid only once per order. So, if you need/want more than one, you will need to place separate orders under different accounts.